This article is 3123 days old. That’s the title of the first of three ART.WORK seminars being put on by the Arts Council Windsor & Region. “ART.WORK is a workshop series to help build the capacity of the artistic community, because being an artist means many different things including: how to promote yourself, how to get your paperwork together and how to pitch your work to galleries,” said Justin Langlois, ACWR Executive Director at last night’s workshop. 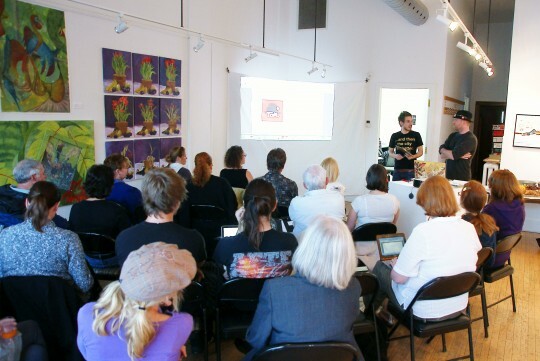 Presenter Tom Lucier explained to a crowd of around thirty curious artists how easy it is to get online, utilize free tools like blogging platforms, twitter and Facebook to make a start for yourself in the digital community. Lucier’s emphasis was on creating a unique and attractive online presence, and how to get those who follow you interested in what you’re doing/saying/thinking. ART.WORK continues next month with “How to Make Yourself Look Really Good on Paper (and Beyond)”, a workshop providing tips for artists to write a professional Curriculum Vitae. The cost? $10. Five dollars if you’re an Arts Council member. If this fall’s ART.WORK run continues to be just as successful as last night, Langlois says the workshops will continue and expand into seminars for performing artists and musicians, and to complicated tasks for the creative class such as when to charge taxes on your work. You can find out more information on the ART.WORK series of events at the Arts Council’s website.